Munting is a verb. - Have we discussed this? - I munt, you munt, he she or it munts. Munto, muntas, muntat as Nellie would have it. Nellie stood in front of a blackboard when I was eleven and waved - well, flapped - her arms about and largely failed to teach me Latin. Latin was not my forte. Burning holes in Mitchell's satchell was my forte. Mitchell sat in front of me - Middleton, Mitchell - it was that sort of school - and a couple of minutes was all that was required with a modest lens such as you might find in your blazer pocket to get the pleasant fumes of burning leather into the atmosphere, and when that palled, it was even quicker to get Mitchell to jump off his chair when the lens was focussed on his ankle. (You had to burn through his sock to get at his ankle.) This wasn't Mitchell who became a judge. This was the other Mitchell, David Mitchell, whose fate (other than having a perforated ankle) remains unknown, at least to me. Mitchell who became a judge became a judge - we sort of deduced that - and forgets my birthday even though he ceaselessly reminds me that his is the 1st of May. But munting is a New Zealand verb, and a jolly useful one too. I don't know how I managed all these years in a workshop without recourse to it. Yesterday I munted my hand, and it bled all over the place. 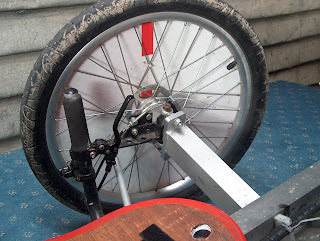 You can only do so much in rebuilding a munted trike frame without removing ucky oily bits with only your fingers and thumbs pincing together and all your other fingers sticking delicately out in the manner used when having tea with the Queen. (Of course I know about these things. Whenever Her Majesty phones me it is to ask when I'm coming back.) When I came to pull bits off Sam's trike, wondering why he hadn't cleaned all the ucky oily bits for me, a Horrid Revelation occurred. Lots of us have used track rod ends as the bearings for bicycle kingpins starting with faux Dursley Pedersens and ending with recumbent trikes. We normally put the thing together, ride, and forget about the bearings reassuring ourselves that any resultant floppiness is normal wear. 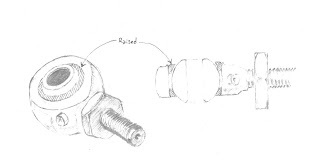 So what to do becomes a Big Problem, because replacing it with another track rod end is - well, you know what it is. And therefore Sam is going to have to wait for me to make totally new new kingpins and stub axles, dammit. And since Susie munted her window this morning, he's going to have to wait even longer.